Christopher Brennan, C.S.C., (left) with Frater Michael Brennan, O.Praem., ’99. Like most siblings, Frater Michael Brennan, O.Praem., ’99, and his younger brother Christopher Brennan, C.S.C., have their differences.“Chris is stronger but I can run a lot farther,” said Michael, tennis player and basketball coach. “Despite being smarter [and] more handsome ...” began football player Christopher, laughing,“I’m probably more of an introvert.” Regardless of their contrasting hobbies and personalities, these brothers have something very special in common. On the Feast of St. Augustine, De Pere Norbertine Frater Michael (pictured above, right) professed Simple Vows at St. Norbert Abbey. 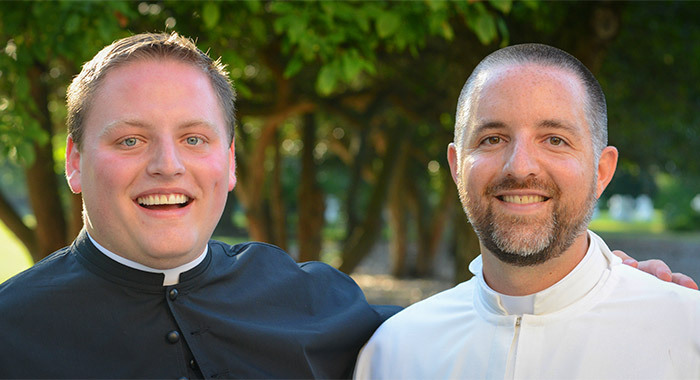 Fewer than four weeks before, Christopher (left),of the Congregation of Holy Cross, had professed First Vows at his novitiate in Cascade, Colo. The Brennan brothers are both on track to become priests within the next few years. The brothers have strong Indiana roots, born and raised in the Hoosier State. Reflecting on their religious lives growing up, both remember praying at meals, participating in the Stations of the Cross every Friday during Lent, and going to church regularly. “I knew I was going to be a priest since I was seven years old,” said Michael. Christopher knows that passion for becoming a religious got passed on. “It made for an environment in which a vocation for priesthood was a normal thing to consider. Mike’s discernment is a big part of my story,” he said. The men’s uncle will also celebrate his 50th year of priesthood in May 2017. The brothers agree that, while being blessed with a vocation to priesthood and religious life is wonderful, starting to recognize a particular religious community as “home” is even more special. As he takes his next step toward becoming a priest, Michael will return to live at Holy Spirit House of Studies in Chicago, where he will prepare for the priesthood at Catholic Theological Union, starting by earning his Master of Divinity and a Master of Theology with a concentration in ethics. Christopher will begin his Master of Divinity at Notre Dame, living at Moreau Seminary. This article is an abridged version of a feature written by Katrina Marshall ’09 for the Abbey magazine, published by the St. Norbert Abbey community. As communications coordinator at St. Norbert Abbey, Katrina Marshall ’09 enjoys an eventful, blessed career involved in anything and everything Norbertine. 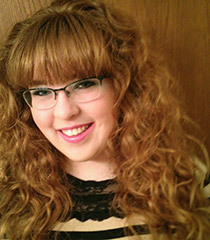 Graduating from St. Norbert with a major in communication and media studies, and a minor in graphic design, she is also one of the "graduate" interns of the college’s office of communications. As a student, she worked in the office for several years, contributing extensively to this magazine. At the abbey, she now puts her wide range of writing skills, artistic talents and creativity to use on a daily basis in all areas of marketing and promotion for the Norbertine community.